The content update introduces players to new levels, plants and zombies. 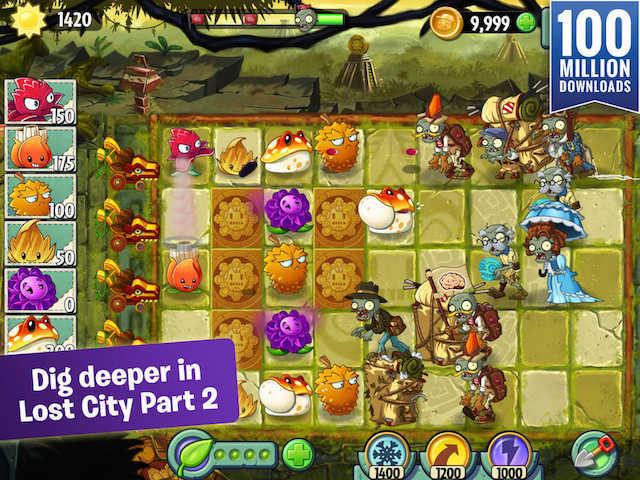 Following the release of the initial Lost City content update in Plants vs. Zombies 2, EA Mobile released (and showed off) the second half of the update, entitled Lost City Part 2. This new update includes 16 additional tower defense levels to complete, along with new zombies to defeat and plants to collect. In Lost City Part 2, players will meet three new plants. The Toadstool swallows zombies before producing bonus sun, but it must chew for some time before it can be used again. While chewing, the Toadstool is weak to enemy attacks. Meanwhile, the Stallia releases a gas that slows all zombies in a small area, across multiple lanes. Finally, the Gold Leaf creates a golden tile when it’s planted. As with the first part of the Lost City content update, these golden tiles will produce bonus sun when a plant is placed on top of them, and will continue to produce this bonus sun as long as the plant lives. As for new enemies, gamers will face off against zombies like the Relic Hunter, which swings onto the battlefield on a rope, potentially skipping defensive lines altogether. Another new enemy, the Turquoise Skull Zombie, launches lasers from its turquoise skull, instantly eliminating some defenses in the path. Finally, Imp Porters will set up camp on the board’s golden tiles, creating tents that will continue to spawn new zombies until they’re dealt with. On top of these additions, the Lost City Part 2 update also offers a new Temple of Bloom Endless Zone and a Zomboss battle against Zombot the Aerostatic Gondola. Plants vs. Zombies 2 is available to download for free on the iTunes App Store and Google Play. The game has surpassed 100 million downloads since its release in 2013.